Ethereum (or more specifically the unit of currency associated with it -- Ether), has seen immense growth so far in 2017. Of course, with any meteoric gains in crypto, it’s never long before the term "bubble" starts getting thrown around. Many within the industry have raised concerns about the rapidly escalating value of the digital currency hot on the heels of Bitcoin in terms of dominance within the space, thinking its decline is inevitable. The ETH/USD rate has shot up, and it is now traded at $294. To correctly assess whether the Ethereum bubble is about to burst, we must first look at what a bubble is, and decide if the rapid increase in price experienced by Ether thus far in 2017 falls into the category of bubble at all. We’re probably all somewhat familiar with the term "bubble" when used in relation to finances. The “dot-com bubble” of the late ‘90s, and the housing market price crash in 07-08 are often cited as major examples but what exactly do we mean by it? A "bubble" is the rapid growth of a given asset’s market price followed by a sharp plummet. This occurs when the price of said asset experiences parabolic growth based on speculation causing it to exceed the value of its fundamentals alone. Once in this phase, any number of instances can trigger a shift in investor behavior which can prompt a rapid sell-off. This leads to a steep decline in price eventually bringing it closer in line with its fundamental value. Is Ether in a bubble? With Ether, the value comes from the Ethereum blockchain and most of this is currently speculative. Many people are betting on the network becoming integral to the next major technological revolution. 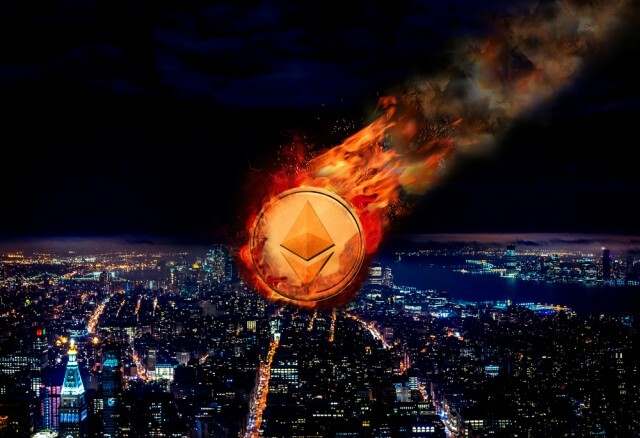 If just a fraction of the many potential end uses for the project come to fruition, then naturally the outlook for Ethereum’s price looks bright indeed. However, as of writing, there are very few projects that are anything more than an idea in the mind of a programmer. Ethereum itself isn’t even finished yet. It’s a work in progress with plenty of opportunity for catastrophic failure. Each of these is of course a potential bubble buster. That said, there is one use that’s currently driving the value of Ether which might itself be the cause of its own demise. ICOs are like crowd funding but with added risks and the potential for huge rewards. A start-up will publish a white paper with the intention of attracting investment from the crypto community. Those wishing to pledge send Ether to an account using a simple programmed smart contract and at the end of the ICO period, they get a predetermined number of tokens created by the company in return. Several early investors in crypto are now multimillionaires so naturally others want a similar opportunity to be in at the ground floor with the next big thing. These ICOs have generated colossal sums of money, and because you need to buy Ether to take part, they cause the price to remain high. The problem with all this is that many of the ideas behind the ICOs are vague at this point and big money is getting thrown at anything irrespective of the team, their progress, or their ability to deliver the goods. Whilst investors are not likely to be too demanding of the projects’ development immediately following an ICO, as time moves on they will be increasingly concerned about just what it is that they’ve bought in to. Just one single ICO company who manages to squander or steal all their pledgers’ funds could cause the whole house of cards to collapse. Even if the company who created the ICO in question is legitimate and just wants to cash out their funds for wages, equipment, bills or whatever else they require to run a successful company, several million dollars hitting the market at once could certainly prove the catalyst of a massive sell-off. Ethereum has famously forked once already. Following the DAO hack debacle, the community were in disagreement over whether they felt it was right to refund users’ appropriated funds. Those who decided against the return continued to mine the original chain (now called Ethereum Classic), and those who felt that it was wrong to let the hacker make off with so much money would update their software to mine a new version of the code -- "ETH" (today simply referred to as Ethereum). This fork had a negative effect on the price although it quickly recovered. However, if the same were to happen in the future, with so much more "get rich quick" money around, who is to say the outcome would be the same? Once the ball is rolling, it can be very difficult to stop. These are just some of the many ways in which the Ether bubble could burst. There are many, many more. Legislation attacking all cryptocurrency, an entire collapse of Bitcoin due to their own scaling issues, or a more advanced and developed project could all be the trigger for a rapid sell-off. Additional weaknesses derive from its current major use case as a tool to fund speculation in ICOs. Whilst Ethereum’s price remains based purely on layers of speculation it lies on shaky ground. Fortunately for those invested for the long term, there are some genuinely exciting projects being built on top on Ethereum that will provide fundamental value to the project. Golem’s global super computer, the eSports platform of FirstBlood, and more regulated crowd funding model of CoFound.It could all provide stability and growth for the Ethereum network. In addition, the eventual work of the Enterprise Ethereum Alliance could of course be a huge price driver. The growing list of names who are interested and experimenting with Ethereum has some particularly exciting additions -- Toyota, JP Morgan, and Microsoft, to cherry-pick the most well-known. With just a fraction of what "could be" coming to fruition, the days where a rogue ICO or pinning hopes on Bitcoin’s success could be a thing of the past.